A detailed concept15MB pdf(PDF, 15MB) for a $9.875 million upgrade to the the Port Macquarie Airport Terminal Building has been developed and is being funded through a $5 million contribution from the NSW Government under the Restart NSW Regional Tourism Infrastructure Fund and $1.25 million from the Australian Government through the Community Development Grants Programme. We will contribute up to $3.625 million to the project. An artist's impression of what the final terminal building will look like can be viewed by clicking the video on your right. How will the upgrade impact the surrounding environment? It is our goal to implement a strategic and sustainable approach to the management and offsetting of environmental impacts associated with the long term operation and future development of essential infrastructure related to the Airport. Biodiversity Certification approval has been received for land in and around the Airport, to ensure the local environment is protected. This ensures the land is managed in a sustainable way, and aims to avoid or minimise the impacts on the local vegetation, threatened species and their habitats through offsetting the impact of any land that is cleared. 490 hectares of the land in the vicinity of the Airport is set aside for permanent conservation protection, which is four times the area of vegetation that may be impacted by proposed future development. 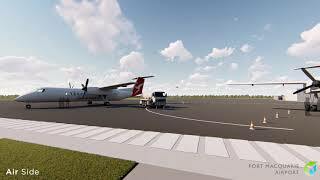 Work has commenced to upgrade that Port Macquarie Airport Terminal and is expected to be complete by the end of 2019. Construction of the expanded terminal building will occur in two phases to ensure an efficient building program, and to minimise disruption to passengers. There will however be some noticeable changes during construction and all airport patrons are asked to be aware of these and to follow directional signage.